Most garden enthusiasts have a few old pots tucked away somewhere. 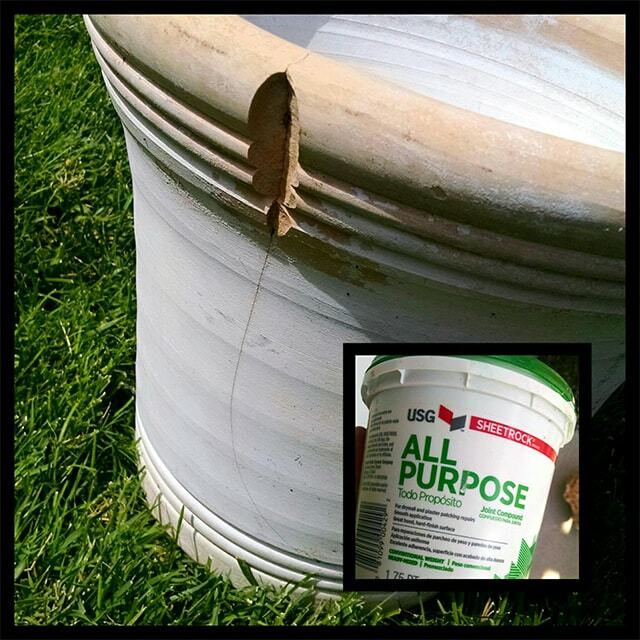 In fact, I often see old cracked pots horded into a corner because they “might have some use eventually”! I do. In fact, I generally stack them up and forget about them, and then buy more whenever I see a yard sale, or really good deal at a garden center. 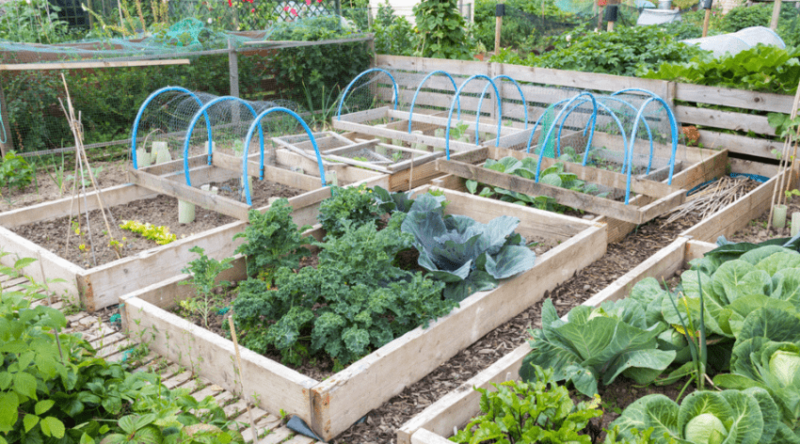 But what if I told you you would save a great deal of money by digging out your unusable pots, and making offers on the cracked or decaying pots you find in a yard sale? Go on, go take a look at what you have. 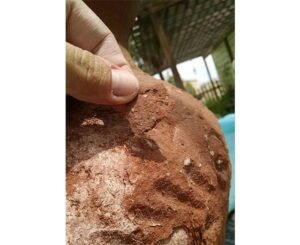 Is the terra cotta decaying? The clay cracked? The plastic getting weak? Put away your wallet, and don’t waste your money on expensive new replacements. For a small fraction of one good pot you can fix up as many as you have to look like new. 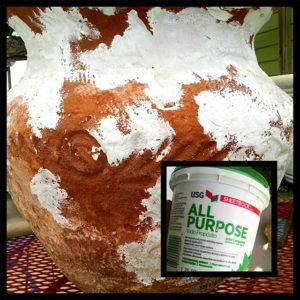 This DIY is going to go over the three most common defects you can fix at home with only a few supplies – and make your old pots look brand new. 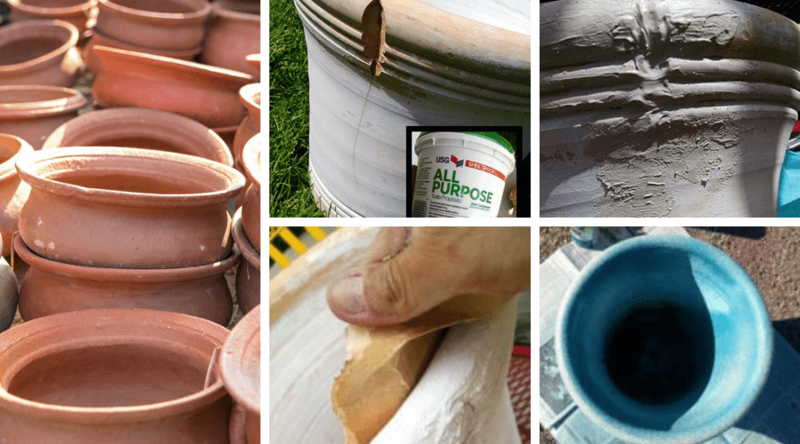 Stop terra cotta rot, fix your cracked clay, and reinforce cracked plastic with these few simple tricks. ROTTING TERRA COTTA? NO FEAR, HELP IS HERE! Nothing is worse than dropping a good clay pot and watching it thud to the ground. 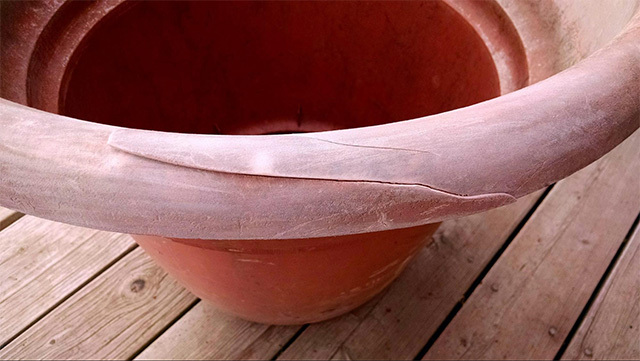 Most likely you’ve cracked it, and if it’s still holding itself together, this is a simple fix – so hold off breaking it up to use in the bottom of a new pot. 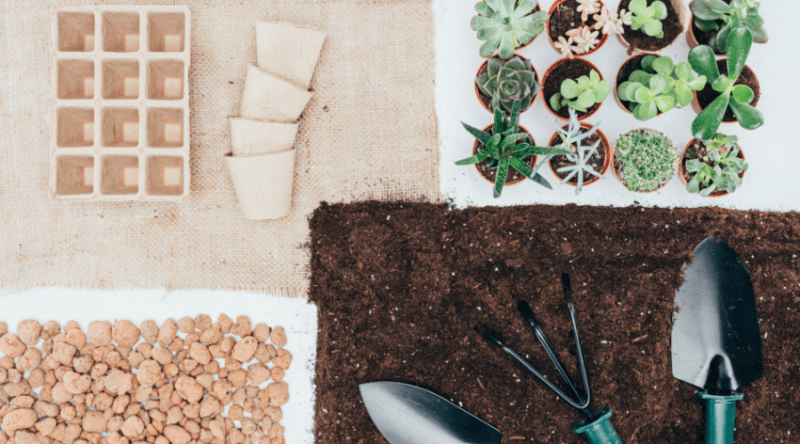 Everything you’ll need you can pick up easily at a local hardware store, but first dig around in your garage, because chances are you might have some of these supplies already. This is a simple enough step to get started with. 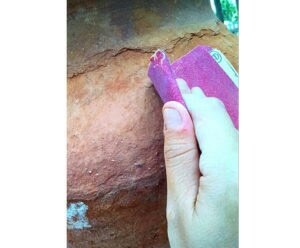 Begin by cleaning off the area around the crack with some fine sandpaper. Be sure to knock any loose clay off as you sand and blow out the fine dust to allow for a good bond when you begin to fill it in. Using the joint compound, use your finger and rub it into the cracks. You really want to make sure it gets into the areas that have weakened, so make sure you check both inside and outside the pot, and it doesn’t hurt to spread it around below and above the crack as well. 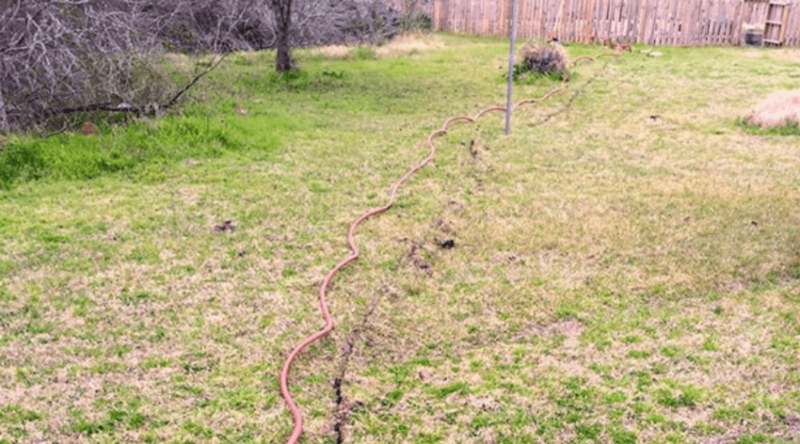 Any cracks that fill with moisture in the winter and freeze will widen, so it’s important to make sure you get these well covered. This stuff dries fairly quickly so spread more over it and smooth it out a little. Don’t worry about how it looks right now since you can sand it down again later. If you have any major chunks missing (like my pot does) fill in the area, letting the compound dry before adding on more layers until you are happy with the coverage. As it dries it does shrink and will pull back from it’s placement. I added three layers to my large crack before I was happy with the results. It is suggested to let this dry for a good 24 hours, especially if you have been layering compound to fill in missing pieces. Using your fine-grained sandpaper again, simply run it over any raised edges or other small ridges and ripples created when you spread the compound on. Also sand down and smooth the compound into the pot. Make sure not to get too enthusiastic during this step as you don’t want to undo any of the work you’ve already done! As you sand take a good look at your cracked areas. If large compounded areas show signs of shrinkage and cracks, fill them in. It nevers hurts to be thorough with this step. 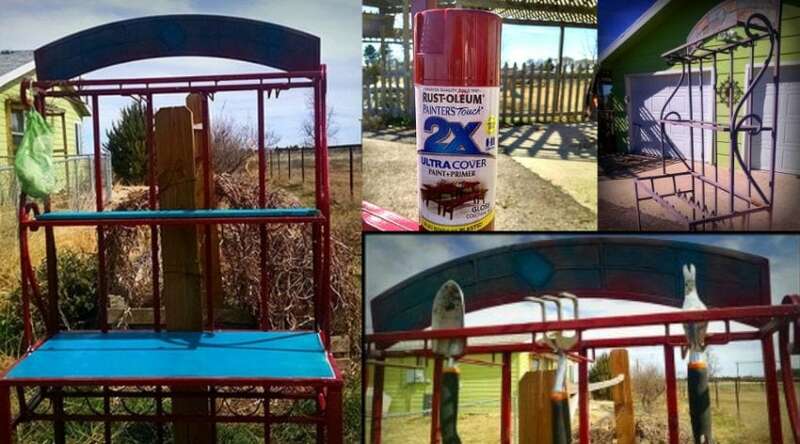 Joint compound is NOT waterproof, so be sure to seal it with a good coat of spray paint. I’m also a big fan of texturizing spray paint on my fix-its to help hide any left behind imperfections. As you can see, this pot has just a little bit of stone spray on top of my base color. I expect to get good use out of this pot for years to come. 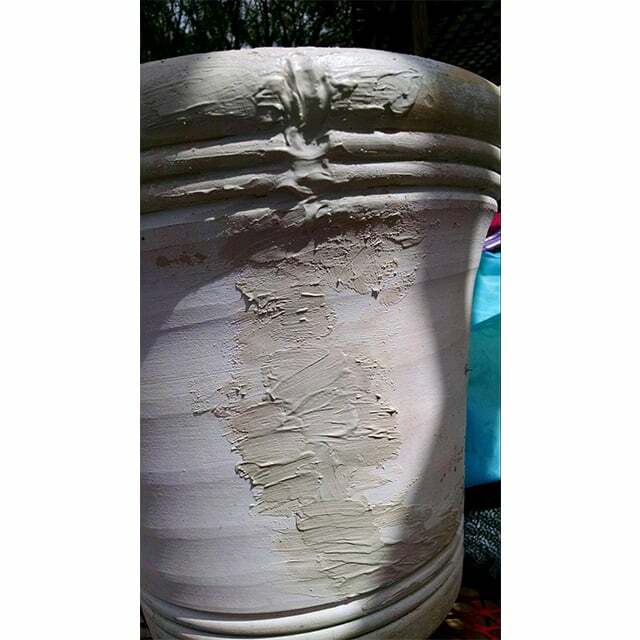 Terra Cotta pots typically last a really long time as long as you don’t shatter them to pieces, but over time they can begin to decay, especially those really pretty ones that have textured designs on them. The reason behind this is that they generally have more air worked in the clay during the design process, and sometimes they aren’t sealed as well, or the sealant misses an area in some little detailed crevice. Over time, moisture gets into these areas and starts to ‘crumble’ the detailing away. But, as long as the inside of the pot is still intact and has good integrity, you can stop this clay rotting process and recreate your pot all over again! Again, you may have the majority of this in your house somewhere, so take a look around before you head to the supply store since you only need a little bit of each! First things first, you need to get rid of the crumbling clay. Using your fingers or the edge of a flat screwdriver, remove all the material that will flake off. Usually areas of direction change, such as in curves and decorative designs, will have the worst of this. Be gentle and only take what comes off easily and is obviously detached underneath. You don’t want to dig into what is left of the pot. Use both medium and fine-grained sandpaper for this to loosen and remove the remaining rotted clay. Don’t get too crazy with this step as you are simply loosening what is already crumbling off and not sanding down what it left. You still need a good base to seal later on. 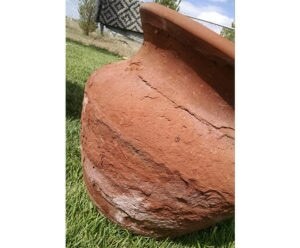 Part of what drew me to this old pot in a yard sale was it’s old, weathered and rotted look. Of course, another season or two left in this condition would have had it melted into a rusty, clay sludge, but I wasn’t too happy about losing all of the old design or cool waves and cracks the rot had caused. I could have sanded this pot down further, but once I felt I had the worst of it off, I reinforced the cracks and patterns with joint compound in order to preserve some of the design and antiquity I loved. You can’t go wrong with this step even though it’s not necessarily needed, however, it can’t ever hurt. Once dried, sand it with a fine-grained sandpaper to get the edges of your work off if needed. I was looking for a pop of color in the garden bed where I want to place this, and I also really wanted to bring out the little bit of design I managed to salvage- so I decided on a two color Ombre look. I also used a light stone, textured spray paint (basically because I love that stuff). This is a step you cannot skip, and make sure to use two to three layers of paint, allowing each to dry in between coats. This is what is going to bind and refresh your clay to keep it from continual rot. Be sure to get into all the little spaces you might have (the joint compound will help smooth these out if you choose to use it). I love a good sturdy plastic pot. Not only are they much less expensive than clay, but the really good ones can usually withstand the weather just as well. Sun and weather can take a tole on it over time however, and can begin to weaken thin areas, such as curved rims. 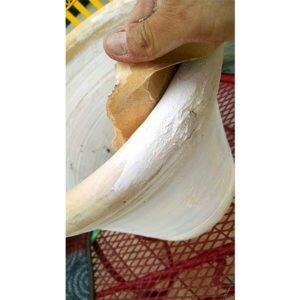 Trying to carry filled pot also can cause unsightly cracks as they aren’t built to hold weight while being moved. Cracked and broken plastic pretty much spells certain doom for the life of your planter, or does it? There is no need to toss your pot (especially if it’s HUGE like mine was) and invest in something new. A simple, cheap fix to a whole new look is on the way! Look for these supplies or simply make a quick, inexpensive run to the store! Layering textured paint is the key to this fix, so be sure not to skimp on this. 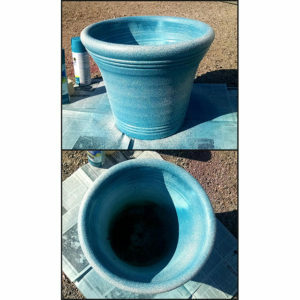 My gigantic 26” pot took one can of regular spray paint, and two of textured to give you an idea of what you might need depending on size. Lightly sand the areas you are going to tape to allow a good bond. Make sure that during this process you do clear off all the dust left behind as it will keep the tape from sealing and later form bubbles. You could also wipe this area down with a little rubbing alcohol as well to make sure it’s clean. Using strips of gorilla tape, tape both sides of the crack, rubbing it down to get a good seal. Don’t use more tape than is necessary, as one layer is good enough. For areas that have curvature or edges, use smaller pieces that overlap a quarter inch. Try to avoid air bubbles. 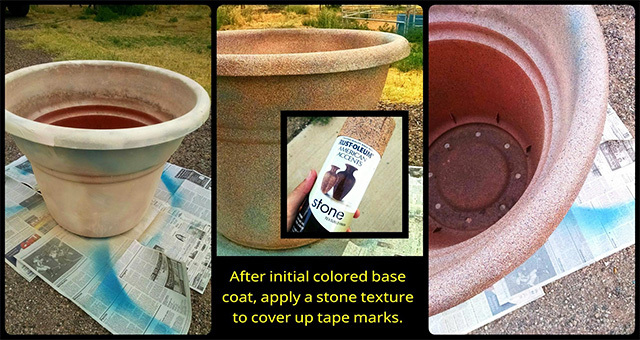 The key to making your planter look like new is textured stone spray paint. The textures and colors of these sprays will coat the tape marks and evolve your plain plastic into something much more exciting. 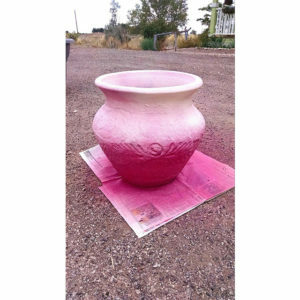 Spray your pot with a base color first and then layer with stone. You’ll want to reinforce your taped breaks by layering paint in thin coats. I’ve found through experience that a thin base color oversprayed with a thin stone spray and then sprayed again with plain spray paint before adding the final texturing give the best coverage. Be sure to allow each layer to dry as the stone spray takes much longer to dry than a regular spray paint. For large taped areas, the tape may bubble a little as the paint dries. If this begins to happen, just let it finish curing (give paint a good 24 hours) and add on another textured layer if the look is undesirable. On my pot, the crack was a good 6 inches and part of the rim curve, making it hard to get a good seal. After my initial layers I added another to make it nice and smoothed out. You can apply any of the painting techniques to any pot you feel needs a good look. 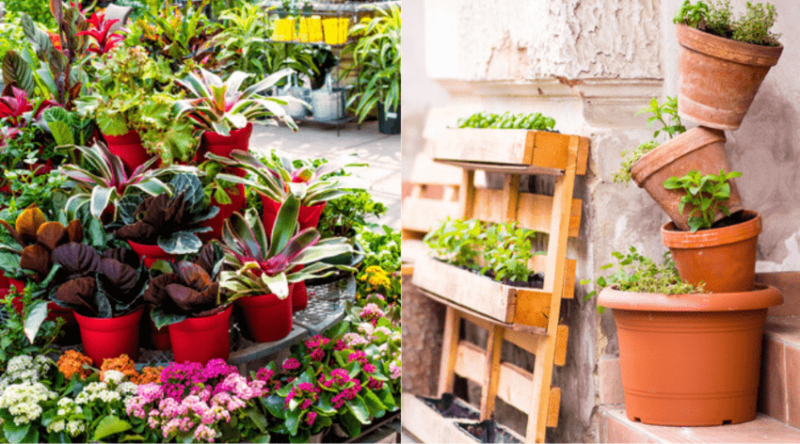 In fact, even if you have a good plastic planter in perfect shape, adding a layer of paint will keep it from weathering even further and give you many extra years of use. I hate tossing anything I think I can fix, but I hate having to spend a lot more money than I need to even more. For approximately $30 I purchased everything needed to fix and refinish these three pots. Plus I have a lot more tape and almost a full little tub of joint compound left for future projects, as well as a few cans of spray paint – so for a fraction of cost for one large decorative pot, I remade 3 pots and can resurface a few more. Feel free to share this article, and if you have any questions or suggestions, (or want to share your DIY stories!) please comment below! 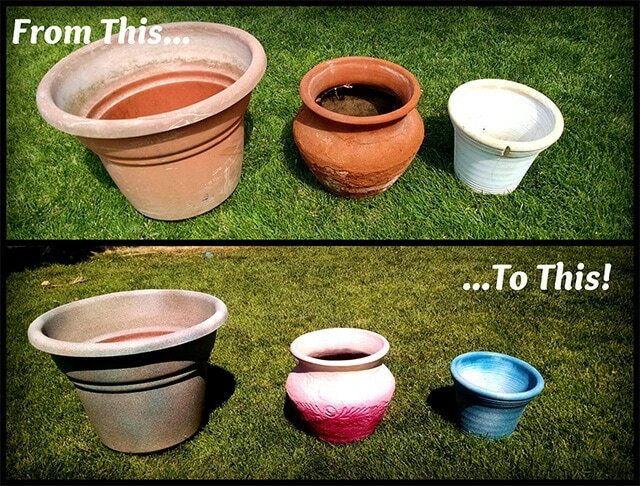 Thanks for your info on how to rescue our decaying pots. Just wondering if you think we could do the rotting terracotta pot while the plant is still in it. We have two in this condition and it would save a fair bit of work not to have to take the plants out and then put them back in (and then risk damaging them in the process).